Without albums like The Road Less Traveled from Norway�s Triosphere, the melodic end of the metal spectrum would be a dreary place. As suggested by the impressive score above, Triosphere�s sophomore effort is a master class on how to get everything right the second time around. Therefore, any musicians out there digesting this review take note, or notes. In fact, if you do take notes, make it a list of what ingredients comprise an album people will be proud to own. The first crucial ingredient is sheer chops. Music chops. Triosphere aren�t just hooks and melody, mind you. Throughout the present album�s dozen cuts are guitarists Marcus Silver and Tor Ole Byberg exquisite displays of technical finesse that would appease the crucifying standards of shredaholics the world over. Then there�s she-singer Ida Haukland, who belongs to the upper bracket of she-singers by virture of a thunderous set of pipes. No kidding, Ida doesn�t just croon, she thunders, and plays bass too. As for drummer Orjan Aare Jorgensen, he�s a cool cat. He must be, considering how complex your average four-minute Triosphere song is. For proof of the band�s sheer chops, have a taste of the intro/outro bracketing this album. The second ingredient is songwriting skill. Triosphere aren�t your fey peddlers of dragons and forgotten realms (*cough* Keep of Kalessin *cough*) and thank your socks the current material is clich� free. This is because Triosphere prefer telling stories. They crave drama. Drama is in abundant supply on every song on The Road Less Traveled, be it the furious pace of Driven or the narrative yarn that�s spun on Death of Jane Doe. The Anger and the Silent Remorse also comes highly recommended. Compelling stories arranged in the timeless verse-chorus-verse-chorus-solo-chorus structure. The results can only be perfect. The third ingredient is imagination. Triosphere eschew the dull symphonic junk for speeding, melo-dramatic musical fare that soars and arcs like a brilliant fireworks display. 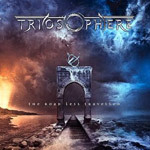 The riffs, the edge-of-your-seat pace, awesome vocals, and furious percussion indicate that Triosphere have their own vision for what they can achieve as a power metal band. Much to humanity�s satisfaction, that vision grabs you by the collar and doesn�t let go until the album�s last song. So the essentials are bulletproof chops, songwriting skill, and imagination. All three combined equals a perfect score. Triosphere: Beyond Recommended. Without albums like The Road Less Traveled from Norway�s Triosphere, the melodic end of the metal spectrum would be a dreary place. Beyond recommended!